fifty | FIFTY SET GO! I was watching The Golden Girls recently. You know, that 80’s show about the adventures of ladies entering their golden years. At the beginning of the show, at least two characters were in their 50’s. When I first watched this in the 80’s, I thought “They are so old!” Rose dressed in old lady clothes. Blanche dressed in grampa old lady clothes. Dorothy dressed like Maude, who I always thought was old also. There was grey hair, aging topics, and the attitude that they were almost elderly and living younger lives. They made growing old look like fun. 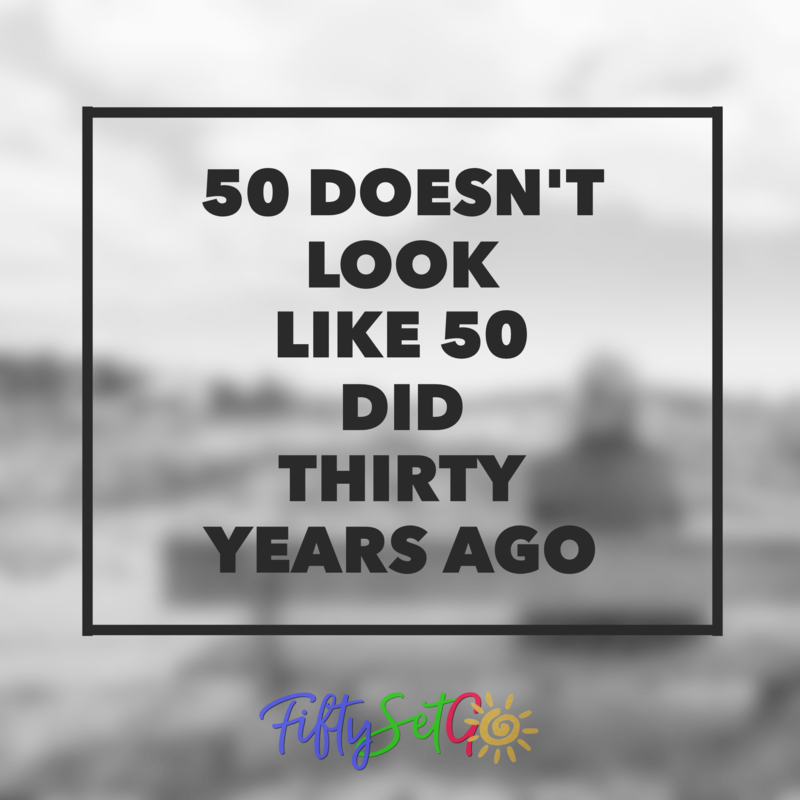 I am not 51 like my grandparents or parents were 51. My Nana died at 54 after a three year battle with pancreatic cancer. She died in the mid-70’s, when treatments were not as successful as they are today. My Nana was always old. I remember her as always having grey hair, wearing dirty blonde wigs and housecoats, and acting like she was elderly. She was a grandmother afterall! My grandpas were the same. Always old. They both worked until they were 65, but even before they retired, they were old. The parents were old at 40. I kid you not. They began acting old at 40. By 50? They may as well have been in rocking chairs. They traveled by motor home and they took cruises until their health declined to the point they couldn’t. But they were never young during those years. I am younger at 51 than my parents or grandparents ever were. My friends? Same thing. We are all more vibrant, active, and young than our parents and grandparents ever were. We live very different lifestyles. We are always learning and expanding our minds. We are not waiting for grandchildren and death. I don’t own one mumu, housecoat, or wig. I don’t sit by the window knitting and watching the world pass by (not that I don’t enjoy knitting!) I don’t even take advantage of the “you’re 50 or older” discounts that are out there (though I probably should!) AARP? I won’t join in principle. Ok, that’s silly, but I’m not mentally “ready” to do that. I am a young 51. Many people don’t believe me when I tell them my age. I like that. I like that I’m mistaken for ten years younger. I like that the cashiers look shocked when they automatically card me and then see my age. That’s not to say I’m not aging. I have less patience. I live more simply. Obtaining material things means less to me. I like wearing flats and flip flops. Heck, flip-flops are my all-occassion shoe (black Crocs to be exact.) I wear mostly black and grey because it’s simply easier. I don’t have to agonize over outfits, I just grab and go. It all matches. I enjoy my alone time. I can’t drink like I used to (probably not a bad thing.) I certainly don’t handle a hangover as well as I did ten years ago. I’m aging gracefully and slowly. My 51 is where my parents and grandparents were in their 30’s.